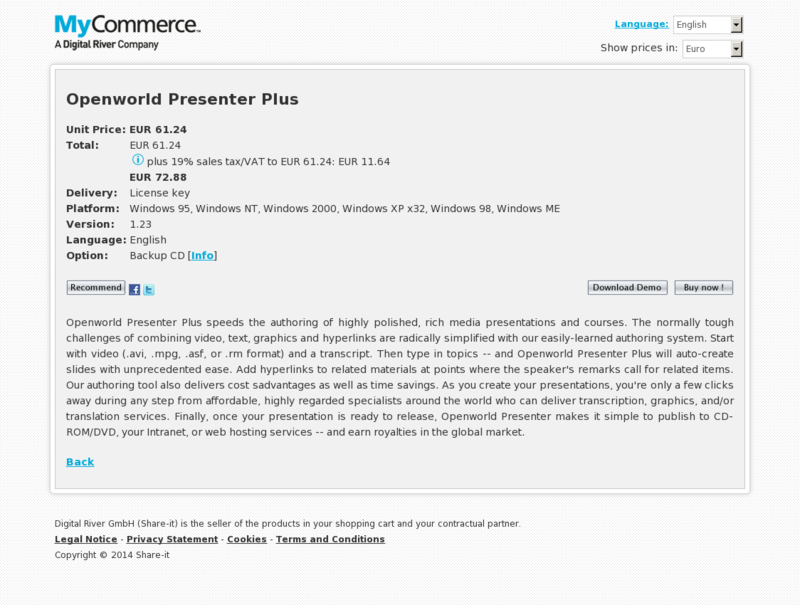 Openworld Presenter Plus speeds the authoring of highly polished, rich media presentations and courses. The normally tough challenges of combining video, text, graphics and hyperlinks are radically simplified with our easily-learned authoring system. Start with video (.avi, .mpg, .asf, or .rm format) and a transcript. Then type in topics — and Openworld Presenter Plus will auto-create slides with unprecedented ease. Add hyperlinks to related materials at points where the speaker’s remarks call for related items. Our authoring tool also delivers cost sadvantages as well as time savings. As you create your presentations, you’re only a few clicks away during any step from affordable, highly regarded specialists around the world who can deliver transcription, graphics, and/or translation services. Finally, once your presentation is ready to release, Openworld Presenter makes it simple to publish to CD-ROM/DVD, your Intranet, or web hosting services — and earn royalties in the global market.